You’ve thrown your pen again. Take a breath, but don’t be worried. You’re wondering why everyone else is seeing success by gaining comments, readers, and subscribers, and you know content is king, but what you may not know is that context is its kingdom. Here on the Convince and Convert blog, one understands why this is such a successful medium for great content. Being convincing is important in your content writing. Okay, go pick your pen back up. 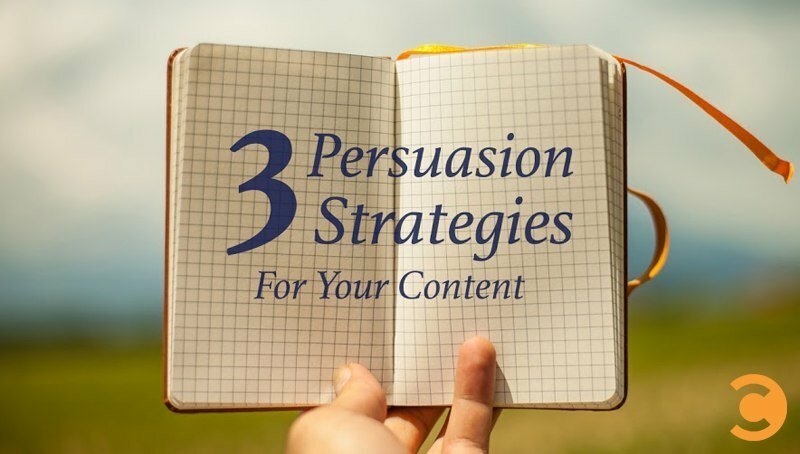 I’m going to show you five persuasion strategies that can help your content as quickly as you can write your next post. I hate to be cliché and say something that you already know, but let’s hammer that one in again. Writing quality content will be the number one reason why people are being persuaded in your articles, not bored to tears with your content. As a writer, you understand this already. However, with the ebb and flow of continual content passing through the eyes of the reader every day, one could feel panic-stricken to publish anything quickly to compete with the constant flow of articles in their niche. When you write quickly, you make mistakes. You can’t make mistakes when there’s that much content floating around. If your article doesn’t have the correct answers the reader needs, they will move on to the next one until they find it. When I first started blogging, I was under the impression that one had to hoard every ounce of knowledge they knew about a topic, and the only way someone could get it was if they paid for it. However, as stated above, the reader will eventually find the answer to their questions. They will find that help they need on a particular topic eventually, and it may as well be you that tells them about it. It’s crucial to understand that you’re not simply trying to pass off what you know with your content, but also give the reader the understanding they need to attain knowledge of that particular subject. This can be done by applying yourself to your writing, making sure that what you know and understand can be passed successfully to the audience so they will want to continue reading your articles. Having a target audience seems like a redundant statement. However, when writing content, you have to understand the audience you are trying to persuade. Your blog is the soap box from which you can speak your mind. Sometimes this gets confused when emotions become high or something drastic happens. It then stops becoming a teaching resource and transforms into an opinionated rant. Don’t stray from the topic. Don’t weave away from the audience you’re trying to reach. Keep reading and learning new strategies in your niche. Don’t stop learning. Stay focused by swimming in the conversations where your target market congregates. Be where your niche is at all times. While these aren’t the only things you can do to keep your mind on the right path, they are some tactics that you can perform daily that will keep you on the straight and narrow. Listening will show you how to approach your target market, and it’s one of the most important strategies you should be doing to target your audience. Remember, targeting your audience is the key to successful content marketing. Personally, I feel one could write a whole article on authority alone. People have different opinions on what authority is and what you must do to gain that position. If you’re a true authority, do you really know it? Surely you don’t go claim that prize in the public stage. That would kill your authority. Authority is the coveted title for which everyone strives but no one will admit they want. As the words of Cartman from South Park ring in my ear, “Respect my authoritah!” It begs the question: How does one gain authority? Again, I’m no authority on authority, but I do have some guesses on where it comes from. If you truly want to make a difference in content marketing, social marketing, and online business in general, then you must learn how to get people to trust you. One thing is for certain: People are creatures of habit. If you can insert yourself into someone’s daily routine consistently, they will learn to trust you. What I mean is this: If you consistently engage with like-minded people, people in your target market with whom you have the same interests, and you do this daily, it’s only a matter of time before a bond will form between yourself and this person. The basis of my Relationship Marketing Podcast is that, as entrepreneurs, we must learn how to stop marketing to the masses and start becoming heroes to one individual at a time. Yes, this means that you’re not going to be successful as quickly. Yes, this also means that you will have to invest a lot of time and energy sincerely trying to get to know people. Not because it’s good for business, but because you truly want to build a relationship with them. A person of authority is given this “power” by their followers, blog readers, etc. It doesn’t mean they know everything there is to know about a particular topic. There are lots of people that understand Semantic Search and the way Google uses this particular algorithm. However, since David Amerland has inserted himself into my daily life on social, he becomes the authority to me personally on this subject. That doesn’t mean he knows it all (which he probably does), it just means that he has marketed himself wisely on my behalf, talking about personal things, not just semantic search all the time. Another example would be the great Martin Shervington, and everything he knows about Google Plus. There are plenty of people out there who know the same amount of knowledge about this platform that Martin does, but the one thing that separates them is how Shervie has positioned himself within the community. These guys have taken the time to build the trust first. The most important persuasion tactic that you can accomplish in content writing has nothing to do with writing the article! The torch of authority is waiting to be passed to you. You don’t have to know it all to become that authority figure in someone’s life, you just have to extend yourself properly to that person daily. It’s a Youtility in and of itself. Be there for people, help them with what they need help with, and you will start to see a push in your direction. Because when people can trust you, they will take your word for it, and you better not let them down. It’s a content-riddled web out there. You don’t have to have the knowledge and power that some people have to make a difference. You just have to show up every day and do your best. It mostly comes because you are who you are, a good person. People like and trust others who are truly helpful and empathetic towards them. Someone who truly wants to help them out. Building a reputation through high-quality content, being there for people when they need you, and doing all of this consistently while juggling your other work is something you should figure out. Because as quickly as you can gain these persuasion strategies, they can be taken away just as fast. Mostly, these persuasions strategies are successful because you are someone that genuinely cares about your blog readers and social followers. Sure, you have to understand how to write content that stands out; that goes without saying. But in order to persuade them over and again, it depends on how well you adapt to the genuine lifestyle that successful marketing demands. Because the first person you need to persuade is you.